What Is La Roche-Posay Anthelios SX? 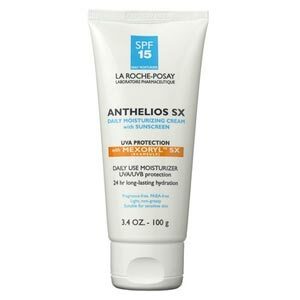 From La Roche-Posay, a division of L’Oreal Group, comes La Roche-Posay Anthelios SX. Silicones, Cyclomethicone and Cimethicone, and glycerin lead the skin moisturizing ingredients infused in this product. These, however, may not be sufficient for a lasting skin hydration that brings longer lasting moisture improvements to your skin. Sold at US $33.98, La Roche-Posay Anthelios SX, performs to bring temporary relief from skin dryness but are not made for lasting moisture improvements. More than anything, this product is a sunscreen with SPF 15. However there are many other well known brands in the market with similar effects and ingredients and they come in a affordable range. As sunscreen actives are often highly irritating, it is a relief that this product has been formulated, as all products in the Anthelios line are, for maximum tolerance of the skin. What Are The Ingredients In La Roche-Posay Anthelios SX? Exclusive Mexoryl SX (ecamsule), a UV filter with peak efficacy against short UVA rays. Avobenzone (2%), Octocrylene (10%): chemical sunscreen actives which, together with Mexoryl SX, provides broad spectrum sun protection.Although it may cause skin irritation. Silicones: It leaves skin feeling soft and silky. Glycerin: May help skin retain moisture while reducing inflammation. Use daily on thoroughly washed and cleansed skin. Apply generously after towelling dry. Reapply throughout the day, every two hours or after sweating heavily or engaging in water sports activities. Recommended for general use although extra care must be taken before using on children 6 months and under. Contains glycerin which leaves the skin with a softer,However sometime causes skin itching ans swelling. Ideal for layering with another skin product. contains parabens, endocrine-disrupting chemicals that mimic estrogen and alter the behavior of estrogen-regulated body processes. contains phenoxyethanol, a chemical used as preservative in cosmetics which has been found to be neurotoxic, most especially to children. Contains silicones which can leave product build up on skin. Does not contain antioxidants for added UV protection. Product serves only one purpose, and that is to provide sunscreen protection. When it comes to choosing products for your skin, there are several factors that need to be considered. Other than your skin type, you must also discern for what purpose that product plays a part in your overall skin regimen.